have your CAKE and knit it too! Fruitcake, Yorkshire Christmas Cake … it just seems appropriate to be thinking about cake during December, no? 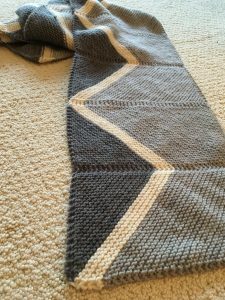 So while you’re wrapping up and shipping the generous gifts of your labors this holiday season, let yourself dream a little about what you’d like to cast on in January for some ‘selfish’ knitting time. I’ll get your imagination going, shall I? 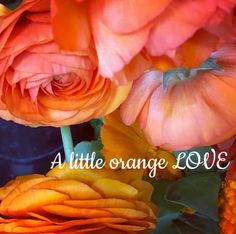 Tina’s been having fun with a few of you already, helping you put glorious colors together for this beauty. 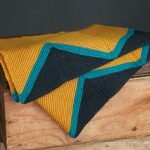 Check out Jocelyn’s original set of colors: mustard and teal and deep navy, oh my! We both chose to do our beginning triangles in the darkest color of the three, then aimed for a ‘pop’ stripe before heading into the MC. Cool thing about this project is that it leaves you room for more! 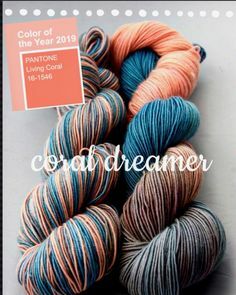 There’s plenty of yardage left over of your first and second colors (Deep Unrelenting Grey and Snowflake from mine) to do some more fun accessories! I’m plotting a Turn a Square hat to go with mine, and who knows? I’ll probably have enough left over to crank out an 1898 Hat as well. 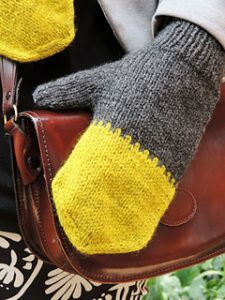 What about “Ease” by Alicia Plummer to whet your appetite for winter knitting? The glorious fine softness of Merino deserves to be cushioned right up around your neck in the cowl-neck version, and the plump stitch definition will show off the wide bands of ribbing beautifully. Or, if you live in warmer climates, there’s a beautiful ballet-neck option as well! Or let’s say you’re dreaming of snuggling into a cardigan. Shannon Cook’s “Timber” has all the hallmarks of a true classic: clean lines combined with interesting details (plus it looks fantastic with a pair of boots!). 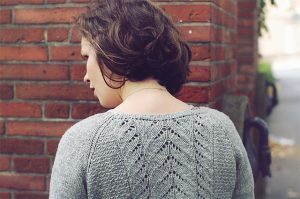 Some of us really want to relax into some gorgeous textured stitches to cleanse our palates, in which case you deserve to treat yourself to “Keera” by Isabell Kraemer. That beautiful lace detail running down the back will keep you engaged and entertained all through the long evenings of winter, and warm after that! 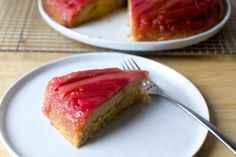 Your appetite for CAKE now having been thoroughly whetted, here’s your coupon code so you can order it up and have it at the ready for a post-holiday selfish cast-on party!